A new study by Rice University scientists reveals that plants can use the sense of touch to fight off fungal infections and insects. The study, which will be published in the April 24 issue of Current Biology, finds that plant defenses are enhanced when plants are touched. "From previous studies, we knew that plants change their growth in response to touch but we didn't know how these growth changes were activated," said Wassim Chehab, a faculty fellow in Rice's Department of Biochemistry and Cell Biology and lead author of the new study. 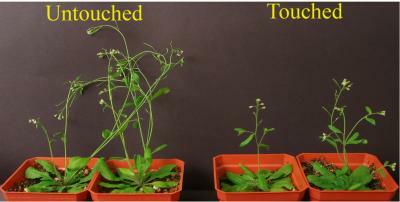 "We used a widely studied plant, Arabidopsis thaliana, to test the idea that the touch-induced growth was regulated by a plant hormone called jasmonate." "Plants can't move, so it makes sense for them to have a highly developed sense of touch to react quickly to changes in their environment," said study co-author Janet Braam, professor and chair of Rice's Department of Biochemistry and Cell Biology. The famed Venus flytrap uses its sense of touch to rapidly close and trap insects. But in prior research at Rice, Braam and her colleagues showed that Arabidopsis was also extremely responsive to touch. In 2000, her lab used tools of biotechnology to produce a plant that glowed with light wherever it was touched. They also showed that Arabidopsis plants that were touched regularly grew much shorter and slower -- much like trees exposed to a windy coastline will grow short and bent. "In this new work, we show that jasmonate mediates this growth response in Arabidopsis," Braam said. "Our experiments show that plants that are repeatedly touched maintain high levels of jasmonate and therefore have enhanced insect and fungal tolerance. In addition, we found that eliminating key genes required for jasmonate production results in the inability of plants to grow shorter and slower when touched." "There are multiple signals that can influence the jasmonate response," Chehab said. "Touch is one, but we also recently found that this response can be mediated by the plant's internal clock, or circadian rhythm. It's a complicated picture, but by piecing it together, we get a clearer understanding of plant pest resistance."